Japanese Prime Minister Shinzo Abe participates in the Vietnam-Japan Business forum, also attended by Vietnamese Prime Minister Nguyen Xuan Phuc, in Hanoi on January 17, 2017. The Vietnamese General Department of Energy granted Monday an investment agreement on a gigantic thermal power plant in the central region to a developer which is a consortium led by Japan’s Mitsubishi Corp. 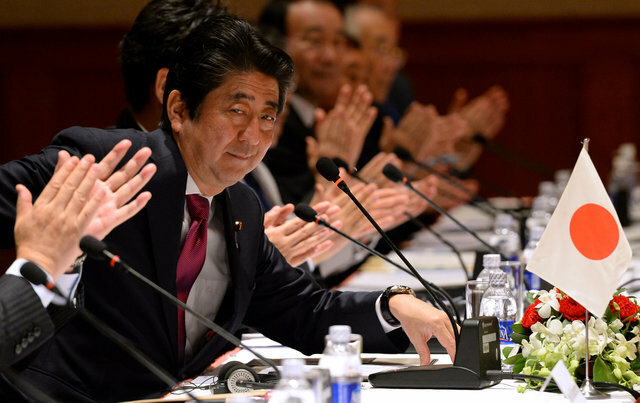 The Build-Operate-Transfer (BOT) contract was awarded to the developer after nearly eight years of negotiation, and within the framework of a two-day official visit by Japanese Prime Minister Shinzo Abe to Vietnam. In March 2009, the Vietnamese government gave in-principle approval for Vung Ang 2 Thermal Power Co. Ltd., a joint venture mainly owned by Mitsubishi, to develop the eponymous facility in the north-central province of Ha Tinh. The facility has a total capacity of 1,200MW, with two 600MW turbines. According to the agreement, the developer is expected to commission the first turbine of the Vung Ang 2 plant by 2021, and the remaining by 2022. The project is located at the Vung Ang Economic Zone and will be fueled by imported coal. Once commissioned, the thermal power plant will help ensure electricity supply for northern Vietnam, as well as national energy security. The megaproject is expected to cost the developer US$2.2 billion. Following the BOT agreement, the Vietnamese Ministry of Industry and Trade has pledged to support the developer in the next steps, including obtaining the investment license and capital arrangement.